Triangle Antal 902 review | What Hi-Fi? Who needs refinement when you can have this much fun? Imagine, if you will, a monster truck. It’s not particularly practical. Nor will it offer a refined driving experience. But take one look at those house-sized wheels and you know you’re in for a lot of fun. And that just about sums up our experience with the Antal 902s: it’s a bit like driving a monster truck. Let us explain, starting with the bit about being impractical. While many rivals at this price want to tempt you by fitting nicely into your sitting room, these Triangles couldn’t care less. They’re heavy, chunky old beasts and that’s that. Not only do they take up a fair bit of space, they also need room to breathe. Keep them a couple of feet from the back wall, or they’ll get a bit boomy. That’s no joke with speakers this size. It won’t come as a surprise when we say these speakers pump out a massive sound, but it’s true. Not only will they fill your living room with ease, they’ll happily occupy the adjacent rooms too. They’re certainly loud enough. We’ll get this bit out of the way: it’s not the most subtle sound we’ve ever encountered. What you get are the broad strokes. These Triangles leave the finer brushwork to their smaller, more sensible rivals. When it comes to conveying finer textures and nuances, these don’t even come close to what the Q Acoustics Concept 40s offer, for example. So why should you buy them? We’ve clearly gone out of our way to paint a ridiculous picture, after all. Because they’re fun. Better than that: they’re fun and actually quite competent. There is a lot of bass. Enough to upset the bookshelf you thought was sturdy. Enough to crack a smile across your face. But it’s not just about the quantity of bass – it’s the taut, controlled type of low-end heft that we like. While the presentation is tonally unbalanced, the bass never threatens to drown out the rest of the frequency range. The treble and midrange have no problem getting their fair share of the spotlight. There’s a surprising amount of control. Notes start and stop when they’re meant to, even if leading edges could benefit from better definition. Another surprise is how revealing they are. The sound is nice and clear, which makes for an insightful listen. Dynamics are strong and far-reaching, and combine with that good feeling of rhythm for a real sense of life. Overall, what you get is a hugely entertaining sound that’s as exuberant as it is forceful. As for the cabinets? We’ve already established that they’re enormous, but they’re also very well built. We’d also suggest giving these speakers a bit of time to run in when you first get them - fresh out of the box, they’re not as coherent as they can be. We’re sticking with that monster truck analogy – at least until we drive home the point. Sure, the Q Acoustics Concept 40s offer more refinement, and the Tannoy Revolution XT6Fs offer greater precision. Still, rarely do we encounter something with the power to make us grin uncontrollably, and that has to count for something. 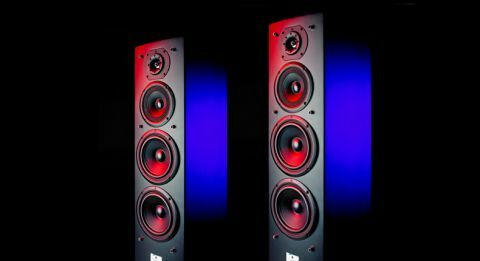 We highly recommend a test drive of the Triangle Antal 902 loudspeakers - you might just love 'em.